A charming Amazon warrior woman delivering a Parthian shot. A figure from the lid of a bronze dinos or cauldron of Etruscan origin excavated at Santa Maria di Capua Vetere, sixth century B.C.E. The Greco-Persian wars and Alexander’s victories proved that light-armed troops could not stop heavy, well-trained, and brilliantly led infantry of the type of hoplites or phalanx. These could only be encountered with heavily armed and highly professional cavalry causing disorder in the massed ranks and then attacking them on vulnerable points with bowshots capable of piercing armour and lances effective against shields. This lesson went home with the Parthians who in ousting the Seleucids from Iran had ample opportunity to experience the effect of heavily armed professional infantry led by Macedonian kings, and soon came to learn about the armament, tactics, and strategy of the Roman empire as well. So they formed their armies on sound bases, taking into consideration what was needed and what was available to them. In extent, the Parthian empire was smaller than that of the Achaemenids; it was also far less centralized. It lacked, for instance, a standing army . There were of course the garrisons of towns and forts as well as armed retinues of tribal chiefs, feudal lords, and of the King of Kings himself, but these were limited and disunited. The military concerns were conditioned by the feudal system: when the need arose, the Great King appealed to his subordinate kings (there were 18 of them at one time), regional, and tribal lords and garrison commanders to muster what they could and bring them to an appointed place at a given time . The feudal lords and officials brought the mustering levies (*hamspāh ), and sometimes supplemented them with foreign mercenaries . The backbone of the army (Parth. spāδ) and the chief power of controlling the empire consisted of the Iranians themselves. 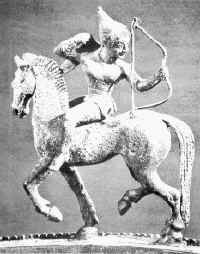 Accustomed from an early age to the art of horsemanship and skilled in archery, the Parthian dynasty secured a reputation that is still echoed in the Persian term pahlevān (< Pahlav < Parθava) while Parthian tactic and shooting are examplary in military histories. The nature of their state and political conditions combined with lessons of history enforced an unusual military structure in Parthia: North Iranian nomads constantly threatened eastern borders while in the west first the Seleucids and then the Romans were ever ready for full-scale invasions. Any stratagem against such a double danger required rapid mobility for going from Armenia to the Jaxartes on short notice; and the solution the Parthians found was to rely on cavalry (asbārān; ‘sb’r attested in Nisa documents). It is true that Parthian armies did have foot soldiers, but their numbers were small and their function insignificant . On tactical considerations, too, only the cavalry could be useful to the Parthians, for the nomads of the east could easily break through any infantry that the Parthians were able to muster, while no Parthian infantry could have matched the Roman phalanxes on the western front. The Parthian nobles (āzāt, misunderstood by Greek and Roman sources as “free-men”) formed the army by bringing along their dependants (misunderstood by Greek and Roman sources as “slaves”). The example par excellence was Erān-Spāhbed Suren-Pahlav who was not yet thirty years old when he vanquished Crassus: he came escorted by a thousand heavy-armed horsemen and many more of the light-armed riders, so that an army of 10,000 horsemen was formed by his bondsmen and dependants . 400 Parthian āzāts threw an army of 50,000 mounted warriors against Mark Antony . Experience had shown that light cavalry-armed with a bow and arrows and probably also a sword was suitable for skirmishes, hit-and-run tactics, and flank attacks, but could rot sustain close combat . For the latter task, heavy cavalry (cataphraoti) was formed, which wore steel helmets , a coat of mail reaching to the knees and made of rawhide covered with scales of iron or steel that enabled it to resist strong blows . This was akin to the lamellar armour of the Sacians of the Jaxartes who in 130 BCE overthrew the Greco-Bactrian kingdom . The charger too was covered from head to knees by armour made of scale armour said to have been of steel or bronze . An actual example of this horse-armour was found at Dura-Europos , while a famous graffito of the Parthian cataphract from the same site clearly demonstrates his full panoply . For offensive weapons the cataphract had a lance and a bow. The spear was of unusual thickness and length , and was used with such skill relying on its weight and power that it “often had impetus enough to pierce through two men at once” . The bow was of the powerful and large compound type which outranged Roman weapons and its arrows, shot with swiftness, strength, and precision, penetrated the armor of the legionaries . The cataphract was probably equipped with a knife as well . So armed and thus skilled, he was one of the ablest and most feared soldiers of antiquity . The Parthian army was at times additionally supported by camel-borne troops . The animal could bear the weight of the warrior and his armour better and endure harshness longer than the horse; also, the archer could discharge his arrows from an elevated position. These would have made the division very desirable had it not been greatly hampered by Roman caltrop (tribulus) which, scattered on the battlefield, injured the spongy feet of the animal . The Parthian tactic was that of harassing the enemy by the hit-and-run action, dividing his forces by pretending retreat and enticing pursuit but then turning unexpectedly back and showering the foe with deadly arrows, and, finally when he was reduced in number and courage, to surround him, and destroy him with volleys of missiles. The tactic was thus unfavourable to close combat operation, and inefficient in laying siege to forts and walled towns; nor could the Parthians sustain long campaigns, especially in the winter months . Since they lacked siege-engines, the Iranians under the Parthian dynasty made no use of Roman machines whenever they captured them . And since the army was composed mainly of the dependants of the āzāts, it had to disband sooner or later and go back to the land and the crops. The Parthian general desired to bring to a close a campaign as soon as possible and return home. When the King of Kings led the army this haste was doubled by the fear of insurrection at home, the frequency of which was the greatest weakness of the Parthian empire. The battle was furious: war cries and kettledrums resounded from all sides, setting fear in enemy ranks ; mounted on the light horse the archers showered the enemy with volley after volley, and then retreated but again turned back to shoot while the charger was at full gallop-an ancient art which came to be known as “the Parthian shot” . Then the shock cavalry (cataphracts) moved in, still avoiding hand-to-hand combat but picking up the enemy with their missiles and piercing them with the heavy lance. Charging on large and trained war horses (see under Ash), of which some were brought as reserves , the Parthians avoided the deficiency of the Achaemenid cavalry by carrying camel-loads of arrows for use in the field as soon as their archers ran out of their own; this enabled sustained and effective long-range engagements and reduced the number of the enemy rapidly . The organization of the Parthian army is not clear, and lacking a standing force, a strict and complicated organization was unnecessary in any case. The small company was called wašt; a large unit was drafš, and a division evidently a gund . The strength of a drafš was 1,000 men , and that of a corps 10,000 (cf. Sūrēn’s army). It seems, therefore, that a decimal grade was observed in the organization of the army. The whole spāδ was under a supreme commander (the King of Kings, his son, or a spāδpat, chosen from the great noble families). The largest army the Parthians organized was that brought against Mark Antony (50,000). At Carrhae the proportion of the lancers to the light horse was about one to ten, but in the first and second centuries the number and importance of the lancers as the major actors of the battle-field increased substantially . The Parthians carried various banners, often ornamented with the figures of dragons , but the famous national emblem of Iran, the Drafš-a Kāvīān, appears to have served as the imperial banner . The Iranians marched swiftly but very seldom at dark . They used no war chariots, and confined the use of the wagon to transporting females accompanying commanders on expeditions . The Parthian period holds an important place in military history. Several Parthian King of Kings, including the first and the last-fell in action, and their three century long conflicts with Rome had profound effects on Roman military organization. For they not only succeeded in repulsing repeated Roman attempts at the conquest of Iran, but they inflicted severe defeat seven in their last days-upon the Roman invaders; and to face the long-range fighting tactics of the Parthian armoured cavalry and mounted archers, the Romans started to supplement their armies of heavy and drilled infantry with auxiliary forces of riders and bowmen, thereby increasingly modifying traditional Roman arms and tactics . The Parthians finally submitted to another Iranian dynasty which had close links with them and retained the power of their nobility, one reason for their defeat being that while they still wore the old style lamellar armour, the Sasanians went to battle with the Roman type mail shirt, i.e., armour of chain links, which was more flexible and afforded better protection .